This fabulous geometric shaped tea light holder will add a chic touch to your celebration. Your guests will be guessing how many triangles there are - a fun way to get the conversation started!. This modern and on trend tea light holder is made of all metal and is plated in a stunning metallic gold metal finish. The gold metal is constructed in a popular geometric design, with triangles connected together in a cut-out 6 sided hexagon shape. The base has a solid gold metal bottom cup for the placement of a tealight or votive candle. The top is open for ventilation and a white tea light is included. Be at the cutting-edge with trendy favors that will thrill your guests. They are certain to use this geometric tea light holder at home - it will look great on a coffee or dining table. Plated in a metallic gold metal finish. Gold metal is constructed in a popular geometric design with triangles connected together in a cut-out 6 sided hexagon shape. Base has a solid gold metal bottom cup for the placement of a tealight or votive candle. Packaged in a clear plastic display box with a matte gold stage for the item to sit on. Wrapped with a gold metallic ribbon and a rectangular shaped 'For You' tag. Are these available in a bigger size by any chance? The other bigger version we have is the Gold Geometric Design Tea Light Candle Holder. The size is 4 1/2" tall x 3 1/4" wide. The top part is the only open part for ventilation and recommended as a candle holder. I recommend ordering a sample so you can see it before ordering in bulk. Yes, you can order a sample of this Gold Hexagon Geometric Design Tea Light Candle Holder Favor at a special price of $1.97. Just enter 1 in the quantity box add to cart and complete the check out. Do these come in silver? I'm sorry, the Hexagon Geometric Design Tea Light Candle Holder Favor is only available in gold. Can i get this without the "for you" tag? 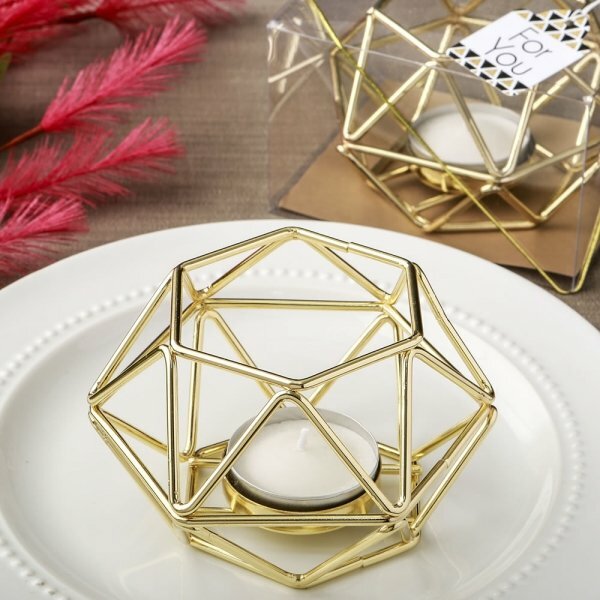 I'm sorry, we're unable to alter this Gold Hexagon Geometric Design Tea Light Candle Holder Favor at all from how they're described/shown on our site since they're shipped directly from the manufacturer. They should work since the holders are 4" x 2 1/2", however you may want to buy 1 sample before placing a larger order to be sure they'll suit your needs.